FK chats to Nicole about her label The Land of Fig and what inspires her wonderful hand stitched designs. 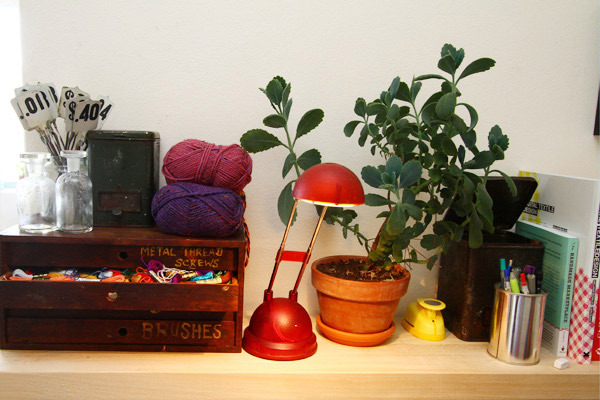 The Land of Fig is a place dedicated to all things creative. My passion is for storytelling through illustration using various mediums, with a focus towards the handmade. 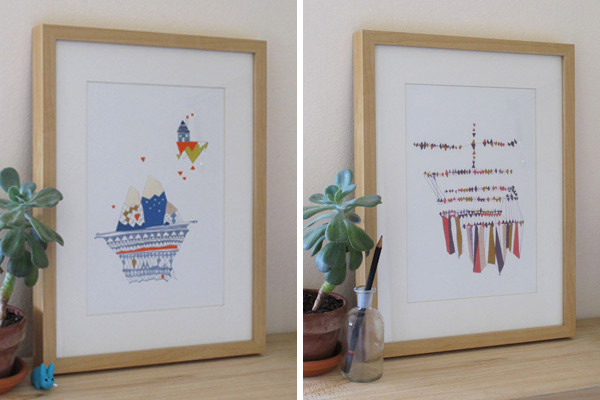 Currently, my products include finely crafted handmade, hand-stitched papery goodness, such as greeting cards and prints. The name came about several years ago. When my best friend was living abroad, we used to write letters to each other and she’d always ask ‘…so, what’s been happening in the land of fig?’ (Fig being short for my surname, Figueroa). I took up the name instantly and started using it as a label for all my creative endeavours. I’ve been interested in art and making stuff with my hands since I can remember. I studied art all throughout school and then Graphic Design at university. I’ve worked as a designer in various industries, from entertainment to fashion, and most recently in advertising. However, it was during the plans for my wedding in September 2011 that my passion for the handmade was rekindled. With this reignited enthusiasm, and employing a newly-discovered skill and love for embroidery, I hand-stitched our invitations, seating plans, menus and name cards. From this, I came to realise how much I loved the tedious, yet satisfying and therapeutic, task of hand-embroidering a picture onto paper. 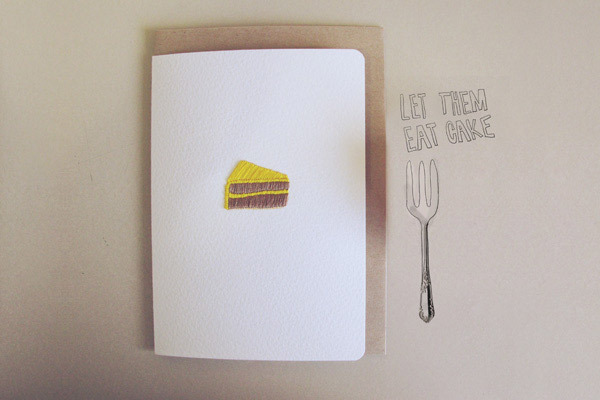 Quick to embrace this, I began to make my first official The Land of Fig products – my hand-stitched greeting cards. I’m a big daydreamer. So my daydreams inspire me on a daily basis. I usually find myself staring out of the window, allowing my mind to become absorbed in the wonder of what I see. I tend to doodle throughout the day, anything from basic shapes to repeated lines on a post-it note, and from this, an idea or a story for a piece usually evolves. I’m also inspired by suburban streets. On my lunch breaks I like to walk around the streets looking at houses and gardens, where I find inspiration in the form, colour palettes and textures I see. My creative workspace is an area in my kitchen. 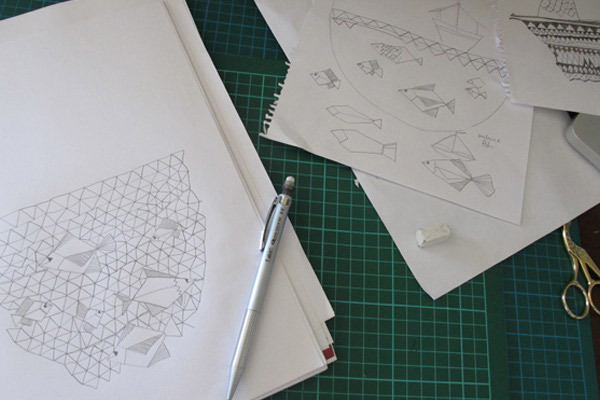 It’s where all of the production happens, from drawing to stitching to packaging items. The kitchen is probably my favourite room in my apartment due to it’s open space, large windows I can stare out of, and plentiful light. 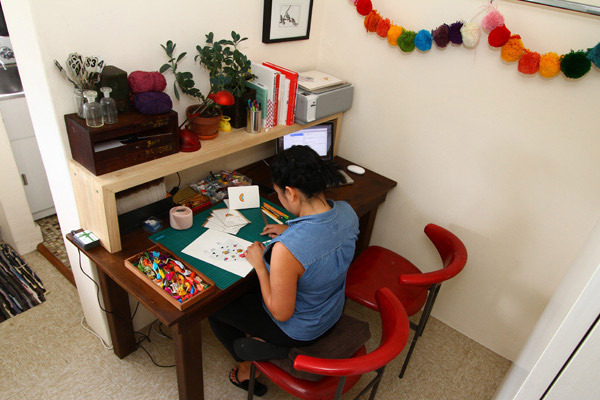 On my work table you’ll find everything I need for my creations including paper, drawing and craft tools, needle and thread, packaging supplies and my laptop. 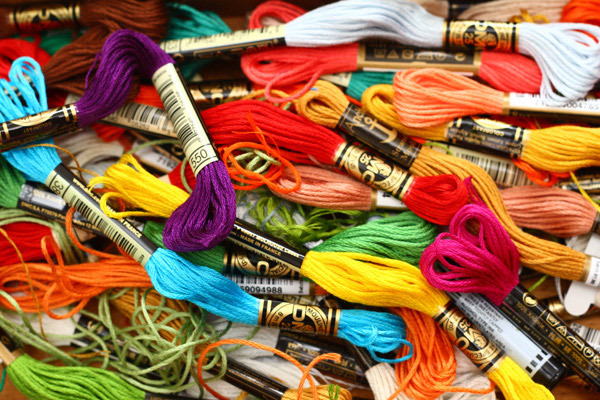 It’s usually a pretty colourful space, often covered in embroidery thread as my collection grows. I usually find myself surrounded by multiple pieces I’m working on at the time as I like to be able to stop and start work between them, depending on what colour palettes I feel like playing with. And my laptop is almost always playing episodes of Seinfeld as I work. It helps me burn through my stitching! 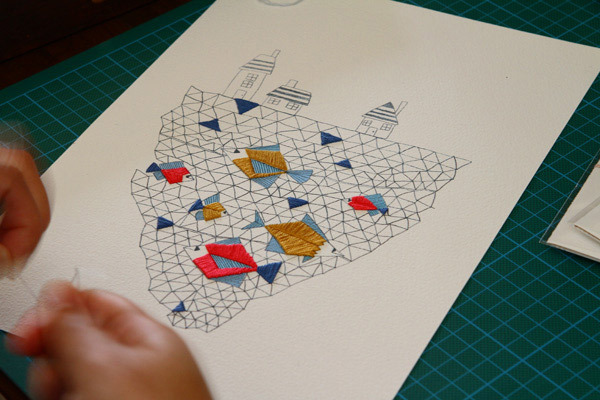 What do you love about working with mixed media of stationery & hand embroidery? 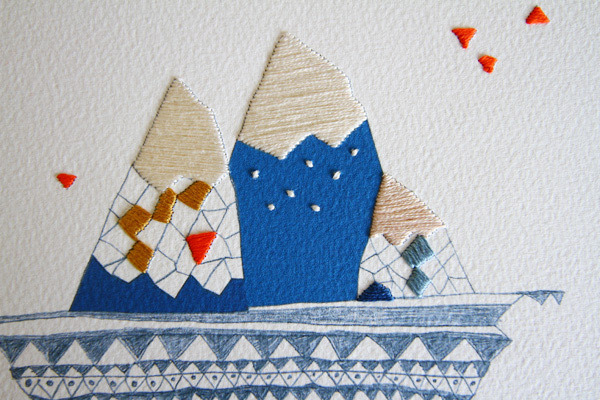 I love the combination of textures between the paper and the embroidery thread. I also love how the vibrant colours in the embroidery seem to finish off the story of the piece. For me, the hand-embroidery is like colouring in. I find working with the two tactile mediums very therapeutic and immensely satisfying. I enjoy seeing the progression as the different elements are added and each new layer created. Each piece is very personal as I genuinely devote love and care to each and every one, and my hope is that this is translated through the quality of the work. What new projects are you working on and where would you like to see The Land of Fig in the future? At the moment, I’m working on some hand-embroidered pillow cases. 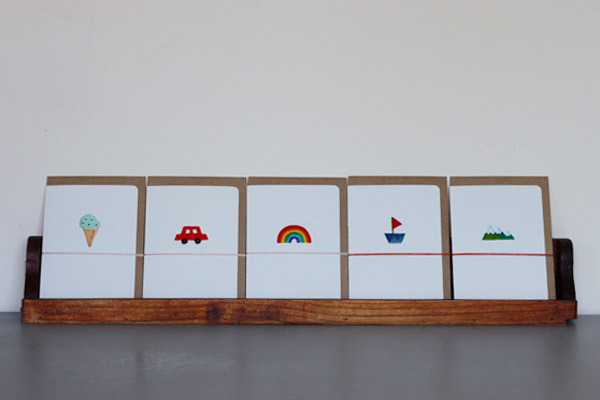 I’m also crazy busy working on some new cards & prints for the upcoming Sydney Finders Keepers markets in June. This will be my first art and design markets so I’m very excited! In the future, I would love to see The Land of Fig move into large scale hand-stitched artworks as well as more textile-based projects. I’d also love to participate in more design markets, for the exposure but also for the inspiration and enjoyment in being part of such a creative environment. 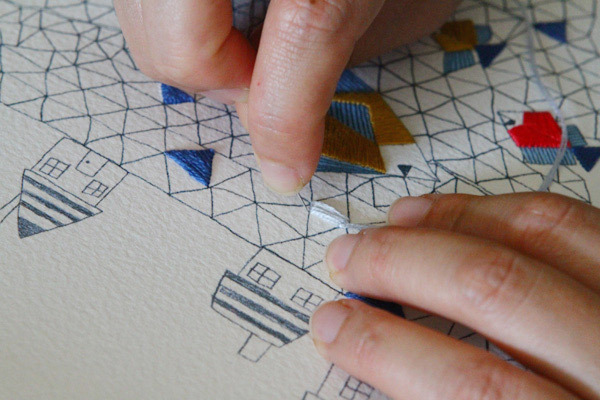 I’m also developing an idea for a hand-embroidered picture book. So watch this space….